Parking: large car park in the middle of the bay, which is free during the winter but requires a payment during the summer months. Limited parking on a slip at the western end of the bay, close to the church. This area is free all year round. During the summer months parking can be difficult particularly on sunny weekends, so you need to ensure that you arrive early. St Brelade’s is the main tourist beach on the Island. 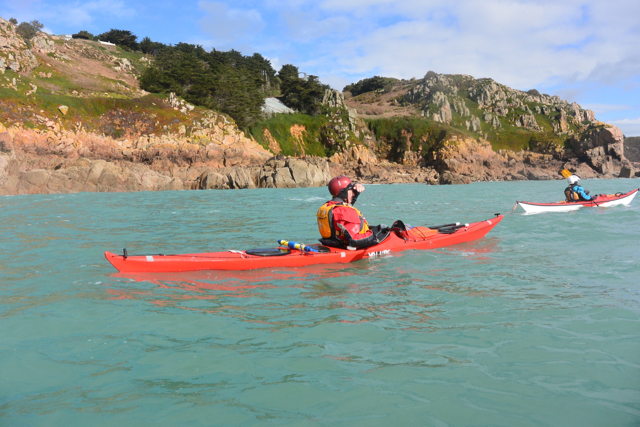 It is possible to do this paddle in the opposite direction but the launch at Corbiere is more challenging than at St Brelade’s. Refreshments: numerous options during the summer months, more limited in the winter. The bar at the Beau Rivage is always friendly, the Mid-Bay cafe offers a range of food and the Pizza Express must have the best view of any Pizza Express in the world. There are other places to eat and drink, which will suit all tastes and pockets. 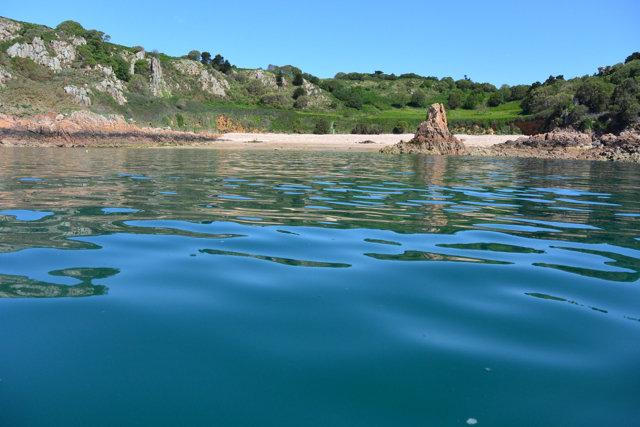 St Brelade’s is where I started paddling in 1969, it is an area for which I have great affection and is still a trip which gives me great pleasure. During the summer I might complete this trip several times each week. The best place to launch is from the slip, which provides access to the beach close to the church. Depending upon the state of the tide you will either have a relatively short carry or a much longer one, which will seriously test your arm muscles if you don’t own a kayak trolley. Heading past the pier there is a reef, just to the east, marked by the navigation pole. Just after low water, if there is reasonable swell this is one of the nicest surfing waves on the Island, breaking left and right. It does get busy with surfers on boards, so it is probably best to surf it early in the morning, when there are very few people around. Bouilly Port is the next bay, easily recognizable by the large number of large houses, which border the coast. This is effectively the last built up section of the coast before we reach Corbiere. Once around the small headland, it is possible to pass inside the stack at most states of the tide, Beauport comes into view. This is without doubt one of the most beautiful bays on the Island. The only land access is down a steep path, from the car park at the top of the cliff. The limited size of the car park, and the steep path down, means that this beach rarely gets crowded. Unfortunately the same cannot be said for the waters offshore, as it is the most popular anchorage around the coastline, for visitors and locals alike. Beauport was given to the people of Jersey by the Boot’s (of the Chemists) family in 1950 and I understand that the small building close to the car park is still owned by the Boot’s family. As a family they are amongst the Islands greatest benefactors with numerous sits around Jersey the result of their generosity. On the western side of the bay there are some vertical cliffs, which are probably the highest cliffs that people aspire to jump off, although to be fair not many people actually do jump from the cliffs. The coast now turns west, with the Grosse Tete, the large stack directly ahead. If the tide is above a certain level it is possible to cut through a couple of narrow gullies close to the shore as opposed to going around the outside of the stack. The Grosse Tete is a natural barrier between the more exposed seas to the west of the island and the sheltered water of St Brelades. 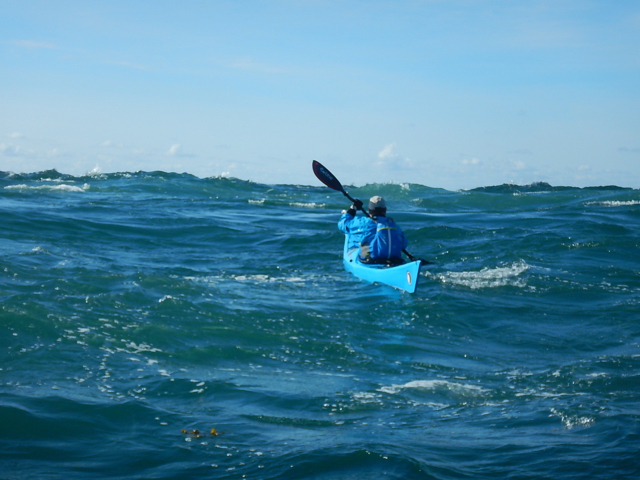 Even during the winter it is possible to paddle to the Grosse Tete most days, but it can be a different world the other side as the North Atlantic swells release their energy. Once past the Grosse Tete you are in Fiquet Bay, the granite cliffs on the western side of the bay focusing your attention. Some years a pair of Peregrine Falcons nest on the cliff and it is always a pleasure to hear them calling overhead. On the south west corner of Fiquet Bay there is an interesting geographical feature, which if time and conditions allow is well worth exploring. A gully, running east – west has been eroded along a dolerite dyke. Scrambling along the gully and then squeeze under some jammed boulders, leading into a large rock pool. A large cave/tunnel leads from the rock pool into the open water, from there it is a matter of scrambling or swimming back to kayaks. As you exit the cave the east facing cliff above you is Trespass Point, which is a popular crag for climbing. Offshore there is a small reef, through which the tide runs at times with surprising speed. The Les Kaines were the scene of one of the most spectacular shipwrecks in Channel Island waters when the SS Roebuck struck the rocks on 11th July 1911 and was left stranded as the tide dropped. The reef is exposed to the force of the swell and particularly during the winter months it can be an impressive place to paddle. Although in the winter of 2017 we accessed the reef on stand up paddleboards, landed on the eastern most rock and then jumped and swam to every rock in the reef. 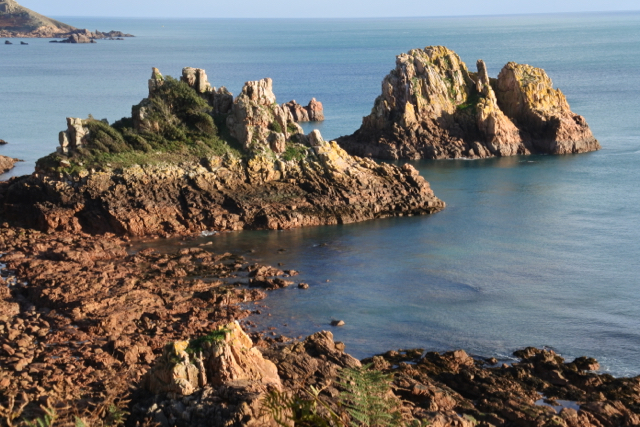 The largest headland between St Brelade and Corbiere is Pt La Moye. On an ebbing tide and a strong westerly wind quite large overfalls can develop off the point. You normally know that you have reached the point because of the number of people fishing off the rocks. Just to the west of the point there is a large gully with cave and blow hole at its rear. This is no longer accessible because the British Army used it as a dumping ground for German equipment at the end of the Occupation and locals used it to dump their disused cars for a number of years. The rubbish is still just visible from the headland above. It was along this stretch of coast that some of the earliest rock climbing was practiced on the Island. Underneath Gorselands there is a pleasant route, Chockstone Traverse, which was put up in the 1960’s by Sir John Hunt of Everest fame. This whole section of coast is superb for coasteering and isn’t particularly popular with many of the commercial outfitters so you are likely to have the area to yourselves. Continuing west there are several old quarries along this stretch of coastline and in places the spoil heaps can be seen tumbling down the cliffs. These helped to supply some of the stone for parts of the Victoria Embankment in London. The largest quarry is now the site of the desalination plant, although it isn’t used that often. Keep an eye open though for Jersey’s only working railway. Coming down the cliffs close to the desalination plant can be seen the railway lines, which are used to transport machinery up and down the cliff. Approaching Corbiere if there is an swell present you start to be aware of it as it releases its energy on the reefs in the area. At times there are ways through the reefs but on other occasions you will want to give them a wide berth. 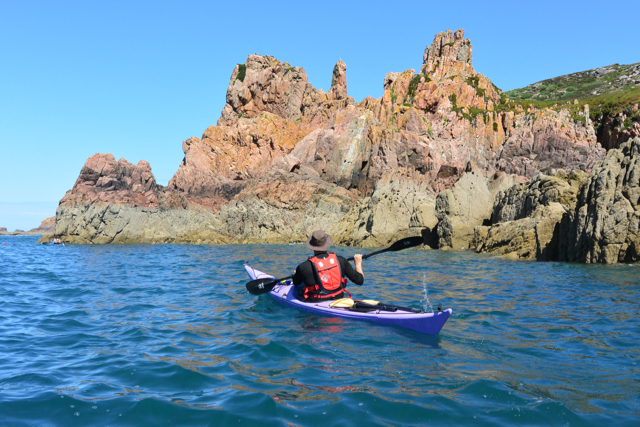 There is a small bay La Rosiere, which is underneath the Highlands Hotel, which has been the venue for the last few Sea Kayak Symposiums in Jersey. Ahead lies Corbiere, with its famous lighthouse. At times the waters in this area can be particularly challenging, especially if there is any swell arriving from the North Atlantic. Approaching the area be alert as to what is happening, try to identify reefs where swells might break and consider your route carefully. On the outside of the lighthouse there can be significant areas of rough water, a combination of fast moving tidal flows and swell. At times it is possible to play on the ebb close to the lighthouse but it is important to note that the streams keep flowing away from the Island, so if somebody does take a swim it can be quite a way to sheltered water. If you do decide to play at Corbiere, it is important to be aware of the environment and plan accordingly. Slack water occurs round about high and low tide. There are eddies at several places along the coast. The west going stream starts several hours earlier close to the shore between Beauport and Corbiere. 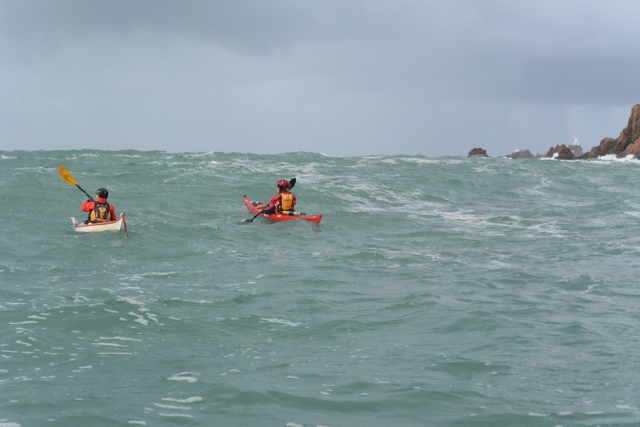 Tidal races, which demand respect, occur off Corbiere and Pt La Moye on the ebbing tide with a westerly wind. 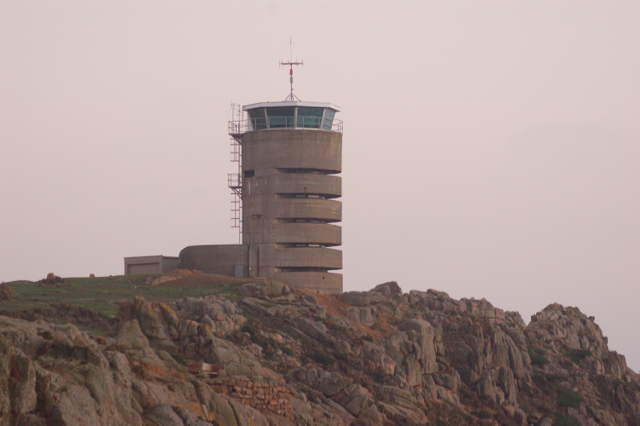 The former German bunker which has been converted into holiday accommodation by Jersey Heritage is a distinctive landmark close to Corbiere. Looking across to the Grosse Tete from the south coast cliff path. 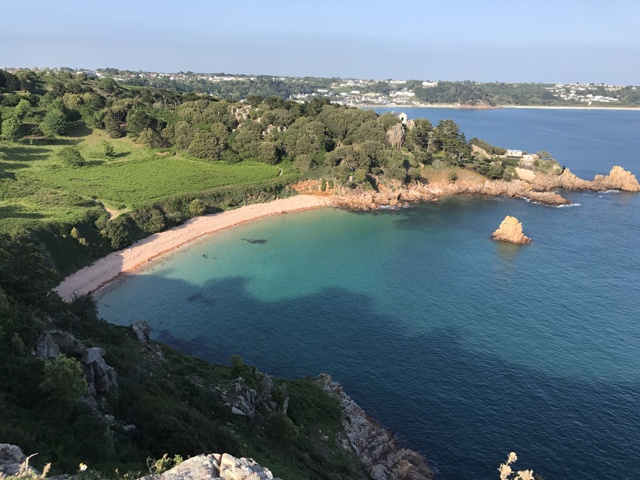 This reef marks the border between the sheltered waters of St Brelade's Bay and the more exposed waters of the north Atlantic. Beauport is without doubt one of the most attractive bays in Jersey. 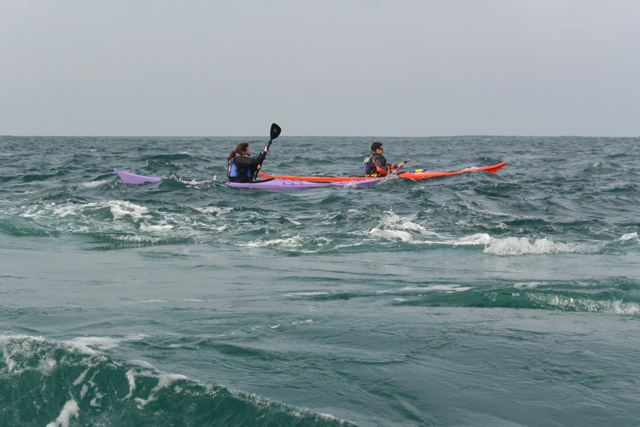 Paddling along the cliffs of the south coast is always special. The granite cliffs contrasting dramatically with blue seas. Corbiere Lighthouse marks the south west corner of the island. On many days the sea is much rougher than it was on this day. Some moving water to the west of Corbiere. The nearest land to the west is Newfoundland. Heading east past Pt La Moye. The cliff above the bow of the front kayak is the outer face of Trespass Point, a popular climbing spot. 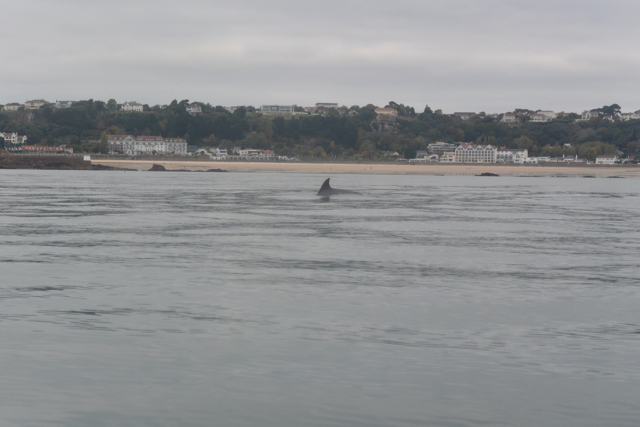 A quiet October day in St Brelade's, we were accompanied by the Bottle Nose Dolphin for about 30 minutes. A very pleasant day to be paddling the south coast. 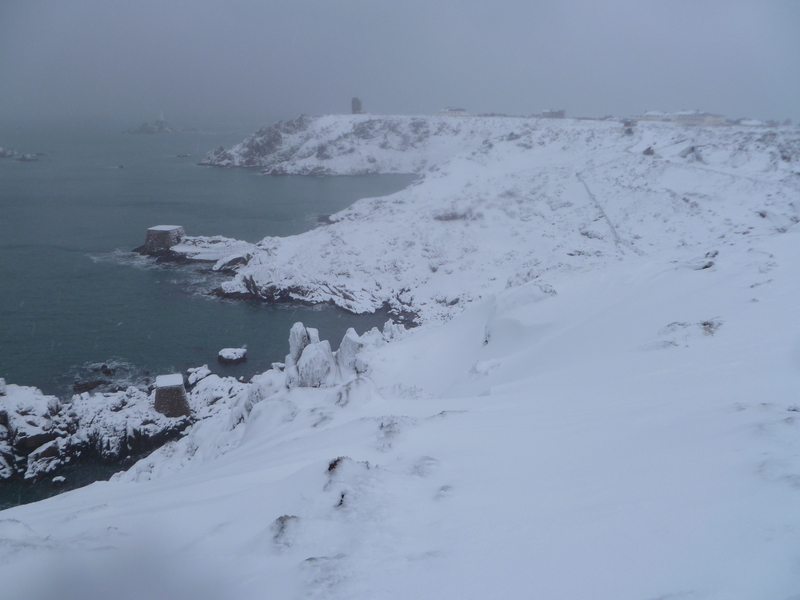 Heading past Pt La Moye towards Corbiere. A day with an interesting swell running. 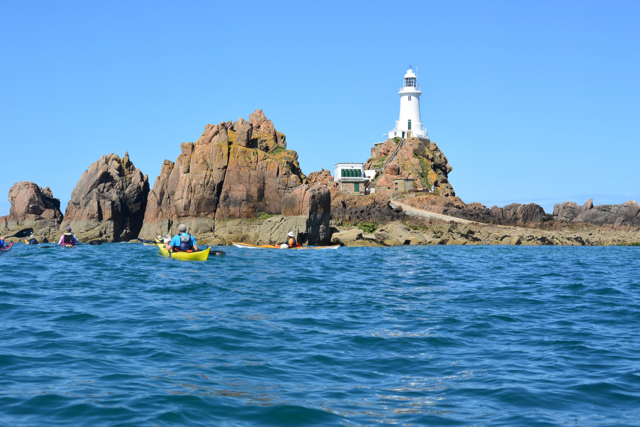 At times the tide race on the outside of Corbiere Lighthouse can be quite substantial. The water is moving from right to left at about 4 knots. At high water Beauport is a one of the islands special places. 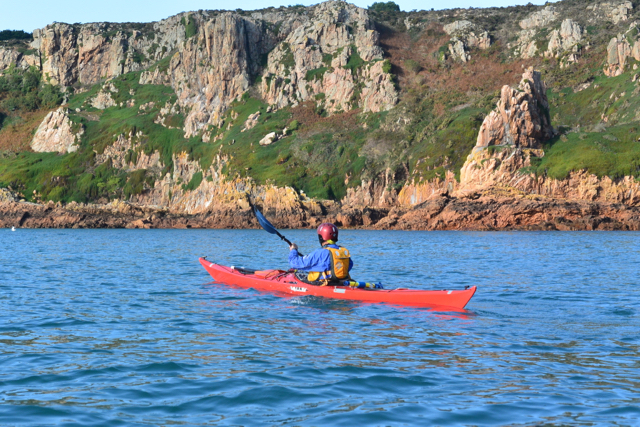 Its not often that conditions like these occur in Jersey but it can make for some very atmospheric kayaking.